A landlord convicted of two murders after a row over rent has been jailed for life. 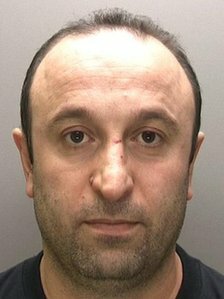 Mehmet Ozen argued with tenant Keyleigh Wright about money and then stabbed her in the arm at their Boston home. Her partner Darren Harwood and best friend Charlotte Piccaver went to her aid only for them both to be stabbed to death, Lincoln Crown Court heard. Ozen, 41, claimed self-defence but a jury disagreed. He was ordered to serve a minimum of 27 years in prison. The jury failed to reach a verdict on a further charge alleging Ozen tried to murder Miss Wright. During the trial the jury heard Ozen had sublet a room in the flat he lived in above a shop in Red Lion Street to Miss Wright after losing his job. But they argued after the Turkish-born British national failed to pass her rent money on to the owner of the property. Investigating officer Det Ch Insp Martin Holbey said emergency services arrived to find a “horrendous scene” with a woman dead in a bedroom, a man dying and another woman stabbed in her arm and back. Miss Piccaver, 26, was pronounced dead at the scene on 21 April and Mr Harwood, 26, died later in hospital. In a statement, Miss Piccaver’s family said the guilty verdict was a relief. “Charlotte was a loving, loyal daughter to all her family and friends,” they said.